Canes Venatici are the two dogs accompanying Bo�tes, the Hunter, chasing the Great Bear around the North Pole. The dogs are found in an isolated region of the skies, just south of the handle of the Big Dipper. The constellation is home to Y CVn, a variable with remarkable colour, well suited for binocular study. 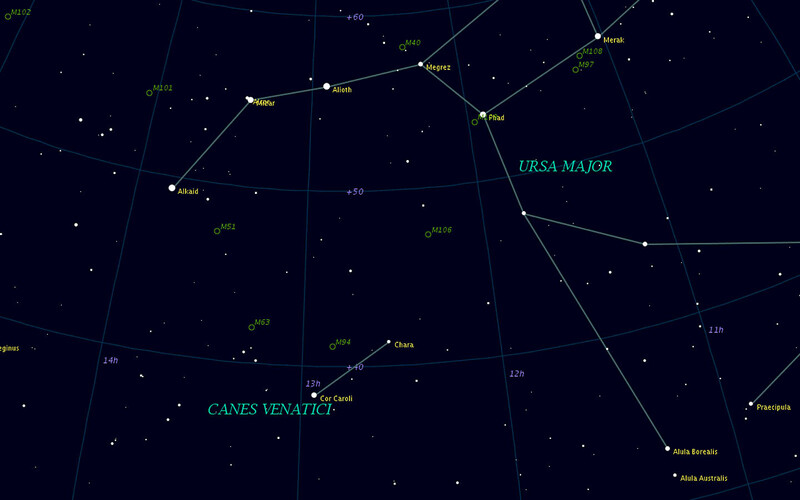 To find Canes Venatici, with the naked eye start at Arcturus -- the brightest star to the Spring night sky, just northeast of Spica. Draw a line from Arcturus to the closest star in the Dipper's bowl, gamma UMa. The brightest star along this line, at about the midpoint, is Cor Caroli -- alpha CVn. Alpha Canum Venaticorum is �Cor Caroli�, the heart of Charles (King Charles II probably). As noted above it is located half-way along the line from Arcturus to gamma UMa. In the same region is M94, a spiral seen nearly face-on and appearing very comet-like in small telescopes. It's 14 million light years away. Alpha CVn is a fine fixed double system: 2.9, 5.6, the brightest (and therefore the primary) being alpha2. The companion, alpha1, is found at a position angle of 228� and a separation of 19.6". Beta CVn is in the same field as alpha CVn. While beta (4.2 mag, 27 light years away) isn't terribly interesting, it has several fascinating neighbours. Put beta at the southern edge of your FOV and you'll see Y CVn and (perhaps) M106. Four degrees to the north-northeast of beta is Y CVn. M106 is a bright spiral galaxy seen face-on, but the bigger the telescope the better. The galaxy is six degrees north-northwest of beta. Y CVn is a carbon star in the same field as beta CVn. The star is 710 light years away. There will be no doubt when you've spotted Y CVn; its vivid shade of red has inspired its name -- �La Superba�. The colour is caused by an over-supply of carbon. Carbon stars are in the latter stages of evolution, and are rapidly losing their mass. The visual magnitude of Y CVn varies from around 7.5 to about 10. Therefore at its dimmest it will be quite difficult to find in binoculars while at its brightest it is a tiny point of brilliant red, an unforgettable sight. The star is classified a �semi-regular� which means its period isn't consistent. However, while once thought to be around 160 days, its period has been recently updated to 251 days. So if the star eludes your binocular search, keep trying.